Foxbuddy was the brainchild of an Australian plumber, Dave Shumak, around 10 years ago. The mobile workflow software he produced was redeveloped by Shane Dale at Propertymode – a company with over 15 years of experience in web and software. Foxbuddy re-emerged in 2011 as a commercial venture with iPhone and iPad apps, customer service offices, and a training staff that taught potential clients how to use the application. Propertymode is a client relations manager. Combined with Foxbuddy, users have access to a hands-on service provider. The company claims that Foxbuddy was created by tradesmen for tradesmen and as such delivers an application that address the everyday needs of field workers. The Foxbuddy mobile workflow software allows users to track workers’ locations, schedule jobs and set them in motion, and prepare detailed reports for clients based on the collected data in the field service software. Field workers can view their schedule and job sheet online instead of going into the office and employers can also send out instant messages to employees. With Foxbuddy mobile workflow software, all information is stored in the clouds which keeps work secure and backed up. 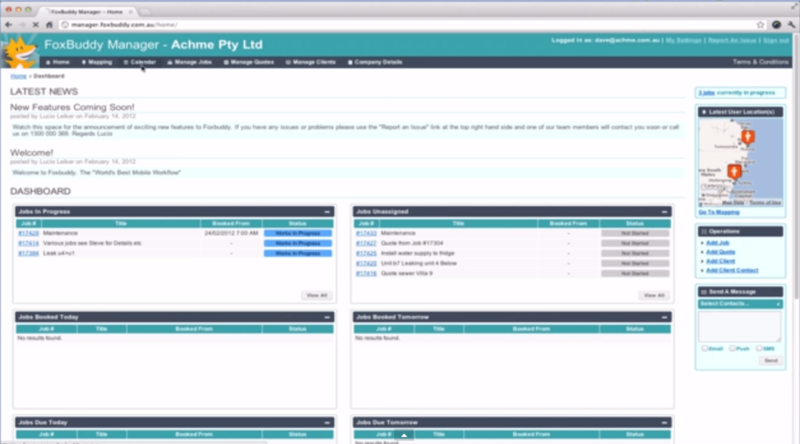 It integrates with accounting services like MYOB, Xero, Saasu, and Quickbooks. Finally, video, images, and audio are an integrated part of job reporting, making Foxbuddy an incredibly modern field service solution. The most impressive aspect of Foxbuddy is the extent to which they offer training in order to optimize companies’ ability to make use of their mobile field service software. Learn everything you need to know about Foxbuddy. Our experts will reach out to you shortly.